EDITED APRIL 21ST. THE NEW KCC HOME EDUCATION WEB PAGE WAS MADE PUBLIC IN ERROR AND IS NOT YET AVAILABLE. HOME EDUCATORS IN KENT WILL RECEIVE FURTHER INFORMATION IN DUE COURSE. 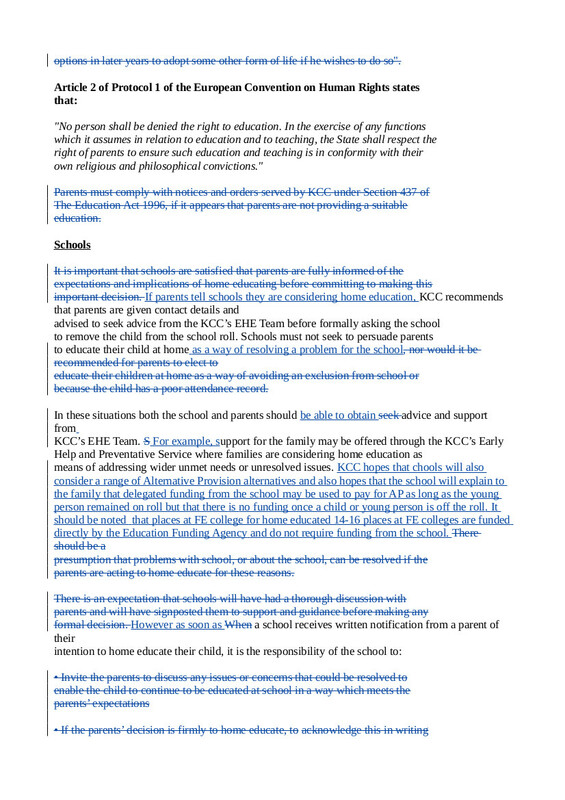 I have written here and here about Kent County Council’s attempts to introduce a new policy for elective home education. The first sentence adds nothing to the policy and is potentially misleading. Parents don’t have to satisfy the school that they are fully informed. Why not acknowledge that schools may be acting out of self-interest when they push families to home educate? It would be good to spell out the 14-16 FE funding unless KCC is trying to keep this option hidden? “Recommended good practice” just means that KCC hopes it will happen. Parents should not be misled by this when they read the policy. This entry was posted in Uncategorized and tagged Government Guidelines, Kent, Kent County Council, SEND Code of Practice 2015 on April 19, 2015 by Fiona Nicholson.